In the end of 20th centaury, cultural arts are recognizing on the scientific bases, and the Muslim scholars also take over the scientific achievements in the world of art. In the Islamic cultural history many branched of arts are developed on scientific techniques. In these six styles after hundreds year of historical period, the two methods “Suls” & “Naskh” were introduced commonly for general use because of their tight principles values. After some time by the cooperation of “Khatt-e-Riquaa” & “Khatt-e-Toquee” a new one style being being established named “Khatt-e-Taaliq”, which was further developed in the form of “Khatt-e-Nasta’aliq”. This is the historical style which is known the result, all the conclusion of Islamic calligraphy. According to historical study Mir Ali Tabrazy was inventor of this style. The characteristic of this writing style was sweetness & the lucid charm, that it forgets all the previous styles of history. After a long time Moghal Emperor Babar contribute a new style “Khatt-e-Babri”, but it could not popular. In the time of Akbar-e-Azam (The Great) also be invented a style known as “Deewani”. Many princes leave this writing style with interest. 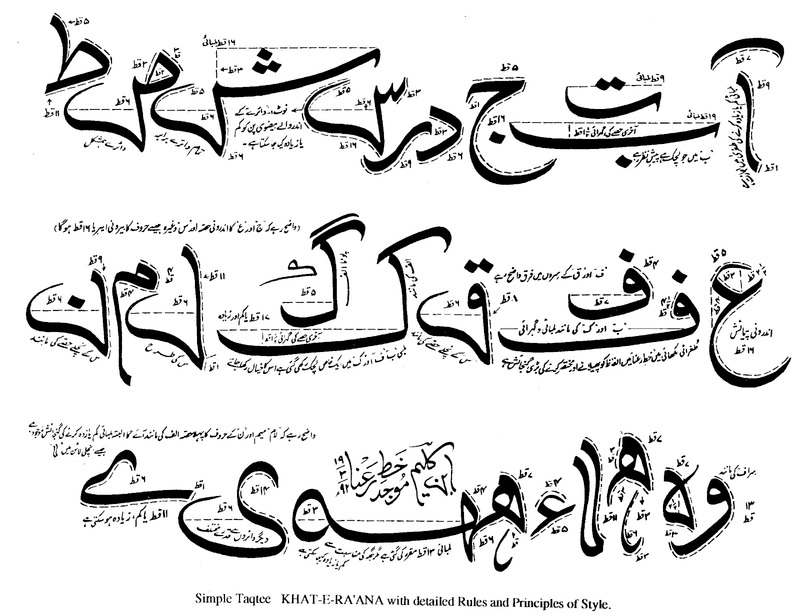 In past, maximum of the Calligraphic production was made in “Khatt-e-Nasta’aliq”. Mir Punja Delhvi also worked on “Nasta’ali”. In past indefinite, the two Muslim Calligraphers Abdul Majeed Raqm & Tajud-Din Zareen-Raqm also prepared the arts in the style and they recognized The Principles of “Khatt-e-Nasta’aliq”. At the present time all the artists of Calligraphy using the explanations of these Muslims calligraphers. Historical background of the calligraphy tells us that calligraphy is not a limited art it has very much vast field to work & research. Today, in the modern world, Islamic art of calligraphy also being introduced as a scientific art. Calligraphy of the present time gave us a valuable contribution in traditional calligraphy & abstract calligraphy. Its abstractive beauty and traditional principles covered the world of fine arts. In the mean time, many calligraphers worked over in traditional way and on the modern calligraphic art. In the pictorial calligraphy, a well known artist “Sadiqeen” worked on canvas by color and brush. In this time of modern techniques & world of abstraction art, a young artist from Multan served the Islamic and Quranic Calligraphy by his personnel efforts. He accepted the challenge of the time. “IBN-E-KALEEM” hardly worked on the six traditional styles of calligraphy & researched on contributions of calligraphy to still. After a very short time, Ibn-e-Kaleem invented a new style named “KHATT-E-RA’ANA”. The main properties of his style are that he justified all of the old styles, prepared rules & principles of style. The “Ra’ana” style has a little of the bitterness and sharpness, the tang and dryness, of the modern taste. This style has beautiful curves & attractive form of drawing. Ibn-e-Kaleem took also interest in publication of calligraphy. He published the first book on calligraphy named “TAREEKH FAN-E-KHATTATI” in 1977. Secondly, published “NOQUSH-E-RA’ANA” in 1978. In this book, six traditional styles of calligraphy explained simply with diagrammatic analysis of each letter, and also given the introduction of “KHAT-E-RA’ANA”. People can learn calligraphic principles by studying this book. Now, third book named “Jalwat-e-Ra’anaie” is published this year. It contains new materials of research in calligraphic world & informatory articles on the subject. Ibn-e-Kaleem’s calligraphic exhibitions have been held at National & International level many times, particularly Peshawer, Islamabad, Rawalpindi, Lahore, Multan, Hyderabad & Karachi. In India Ibn-e-Kaleem’s calligraphy introduced in Ghalib Academy New Delhi in December, 1979 and the other one exhibition held in Arab Cultural Centre New Delhi. Thousands of Indian people, Calligraphic Artists, Professors, & Writers welcomed Ibn-e-Kaleem with great respect & appreciated his newly invented style “Ra’ana”. 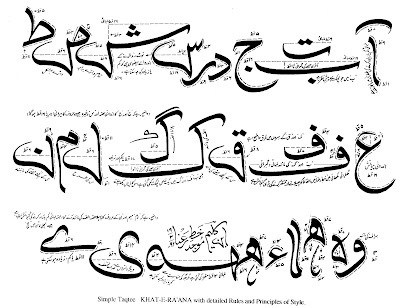 Now-a-days Ibn-e-Kaleem is working on abstraction calligraphy of Khatt-e-Ra’ana. He prepared some arts in this manner which shows complete abstract painting in the form of Khatt-e-Ra’ana. Ibn-e-Kaleem is a gift of nature for us. May he serve the Islamic art forever. Multan & Pakistan can also proud on the service of Ibn-e-Kaleem. انقلابی تحریک اوراس کا طریقۂ کار! This Magazine is Published by mubasherkaleem@gmail.com. Simple theme. Powered by Blogger.